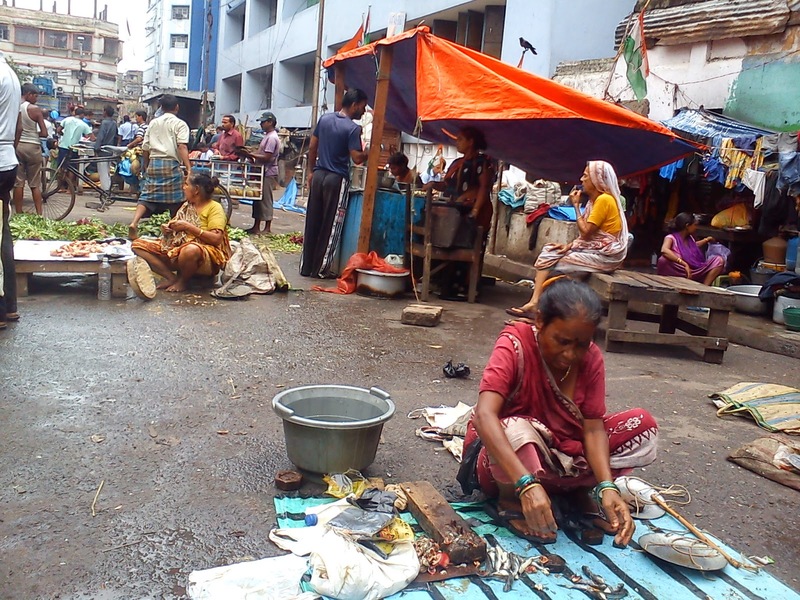 Travelling to Kolkata was on my list for a long time until I finally decided to set off and see what the world is like in the south eastern part of India. I am from the north so I had only heard about it or seen it in travel channels, old bollywood movies and other stuff like that. I travel on a predefined budget and this time it was no different. I made the train bookings and decided to not plan too much and leave some room for adventure. This was going to be like an alien visit as I do not speak anything except English or Hindi but this didn’t seem like a problem at the time. Another thing which was fascinating about the journey was that we were going in the worst possible weather conditions. But fortunately the monsoons were late and we were left with the Indian summers in a train journey that would last for at least 40 hours. Me and my friend, who is an athlete (read superhuman), were excited to hit the roads again as it had been two years since we had travelled together. 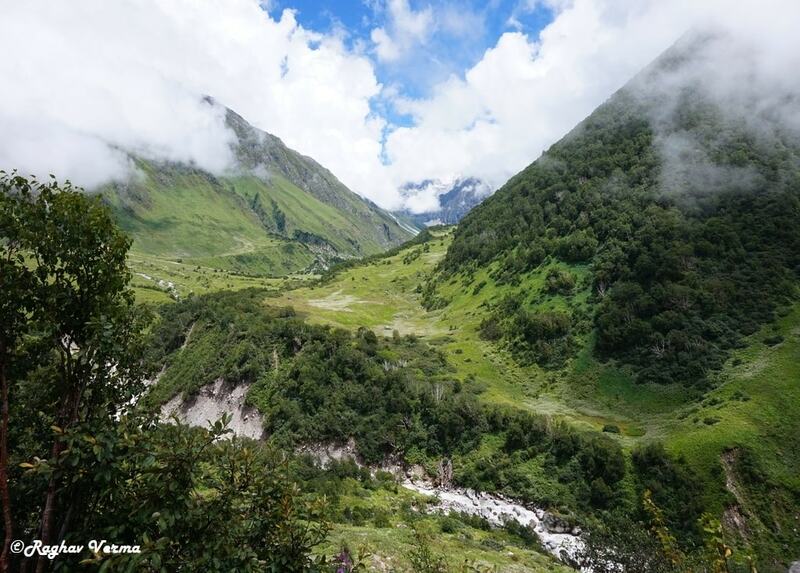 So we boarded the 8:30 train from Dehradun railway station and set off to a long journey which would take us all the way through Uttarakhand, Uttar Pradesh, Bihar, Jharkhand and then finally to West Bengal. The best part about travelling is not the destination but the journey. Travelling with so many people is really an enriching experience for the mind and soul. Train journeys are so special because you get a chance to actually interact with lot of people and it is an excelleny way to satisfy the inner curiosity. We saw some pretty great things on the train and came to realize that we should avoid eating the food that they sell at the station and try to live on fruits and stuff which doesn’t spoil like soaked grams and boiled eggs etc. 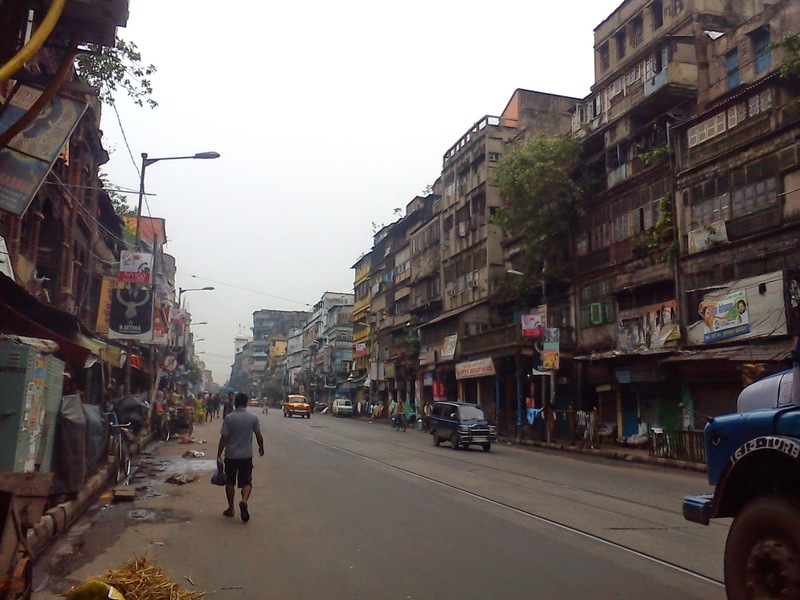 Kolkata is a major tourist attraction for people from all across the world mainly because it was the capital of India and the first metropolitan city as well. The Bengali culture is considered one of the richest and most attractive cultures throughout the world with its extensive popularity in the fields of film, music and literature. Being an art and history lover so I was really excited to see some museums and visit libraries as well. So we reached Kolkata at the right time (thankfully). Getting off at the platform of one of the biggest cities in a country like India is an experience that no one should miss. An astounding number of people in a single place is a sight to be seen. I think that is why Kolkata is considered a destination for travelling veterans, maybe to take the culture shock in a lighter spirit. We were startled by the speed by which everything works there. You can see markets starting not too far from the platforms and people actually start shopping the moment they step their foot in this city. It was quite amusing to see chaos at such an early stage and the day had just begun. When you step out the railway station, the first thing that you see is the glorious Howrah Bridge and before it stands the glorious Rabindranath Setu. It is a huge steel structure which looks magnificent from every angle that you can see. Built in 1943, this bridge is still an engineering marvel. 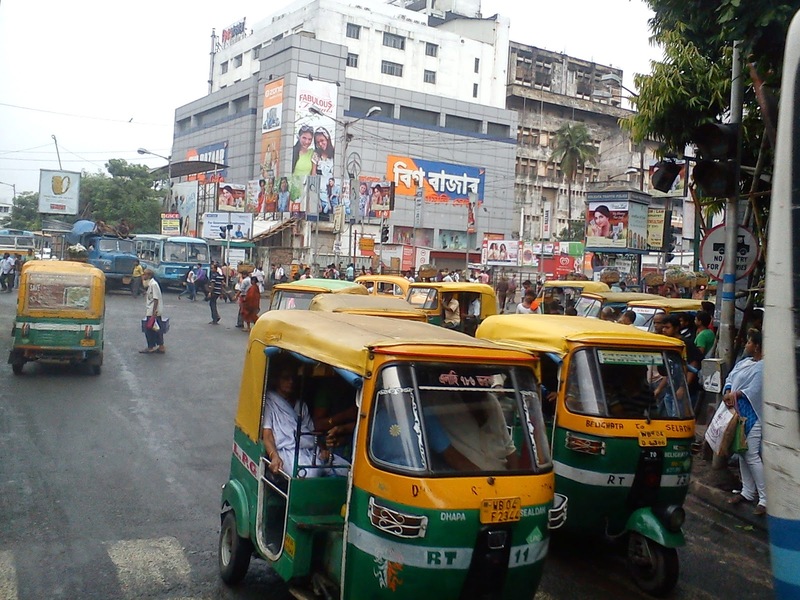 We found the buses going to the inner part of the city and it was not difficult to find a bus to the nearest hot spot of the city which is called New Market. We knew that we will find accommodation and good places to eat there. After all, food was one of the major things which drew us to Kolkata all the way from the north. We saw a few hotels and finalized hotel Raunak which was near Nizams, a traditional restaurant which offers great Mughalai and authentic bengali food. The hotel is situated at the main market place near the S.S hogg market and we were able to get a room for two at 550/- per night. The rooms were reasonably clean and there was nothing fancy. We needed rooms to sleep so we just kept our bags in the room and left to explore. We had a list of foods to try and places to visit so it was not difficult to decide that we needed some tasty breakfast and “Kusum” rolls was what we needed at the time. Now I will cut it down to the best parts and will tell you what to do while you are in Kolkata. Kusum rolls are a shop on Park Street which offers what I can call the best kathi rolls on the face of planet earth. It was a nice walk and it was cloudy which made it a pleasant experience. 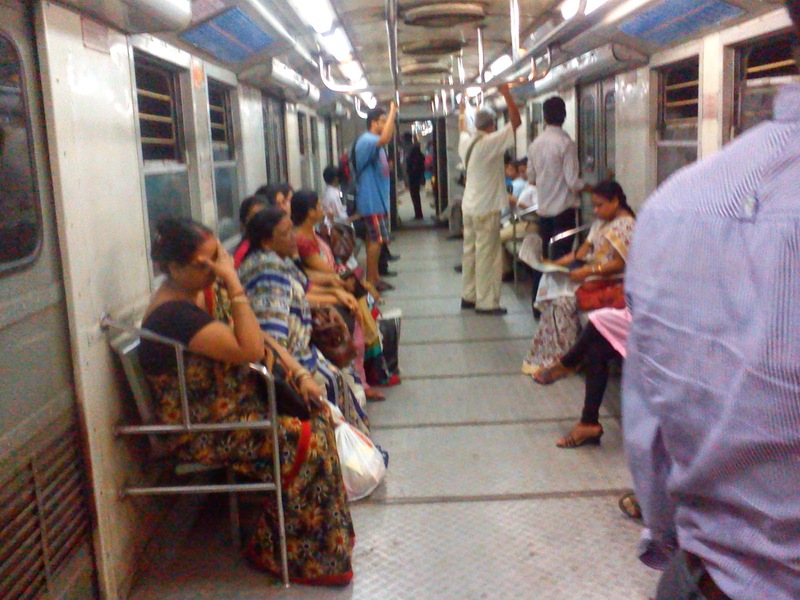 You can easily board a metro rail and reach Park Street from new market for just 5 bucks. As I said we were an excited bunch of free travelers who like to be on their feet. 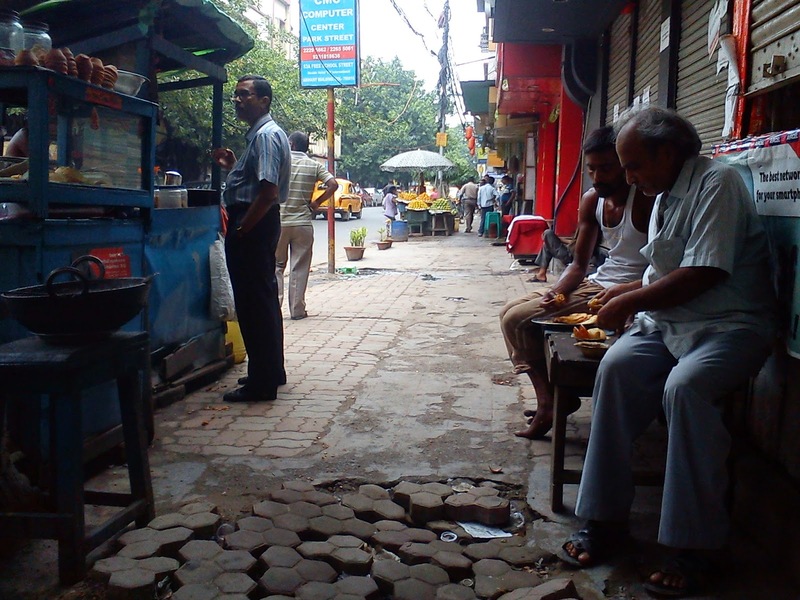 We took a long walk and managed to reach kusum rolls at around 11:00 in the morning. We had a single chicken single egg roll for 45 bucks and got a great deal. For the veggies out there, some great options are available and you can easily get a tasty kathi roll at a price which makes both your stomach and your pocket happy. It was hands down the best chicken roll that I had ever eaten and I still get nostalgic hungry when I think of the taste which they are able to provide in such a tasty meal (read work of art). Another place, Deckers Lane on the part street, is what I can call the heaven for street food lovers. 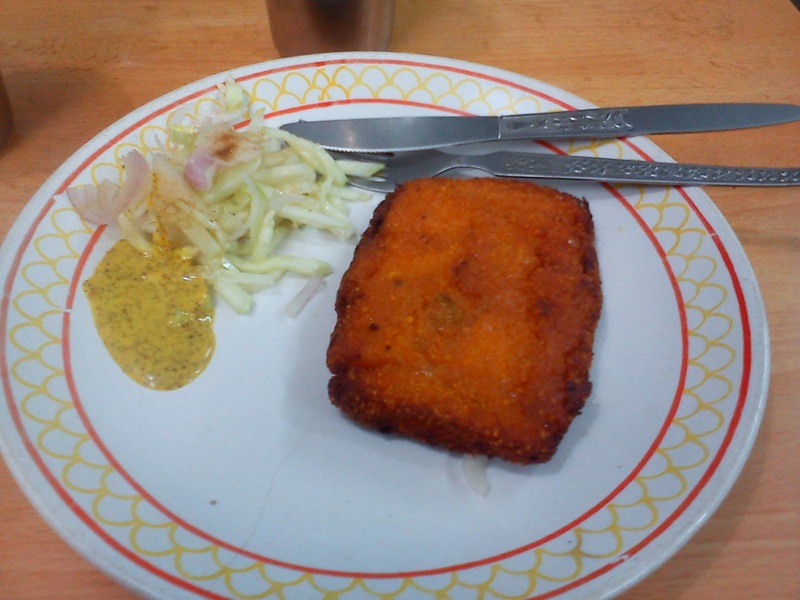 You should definitely try the fish cutlets from any of the restaurants and you will happily say that you have never had such fish in your life. 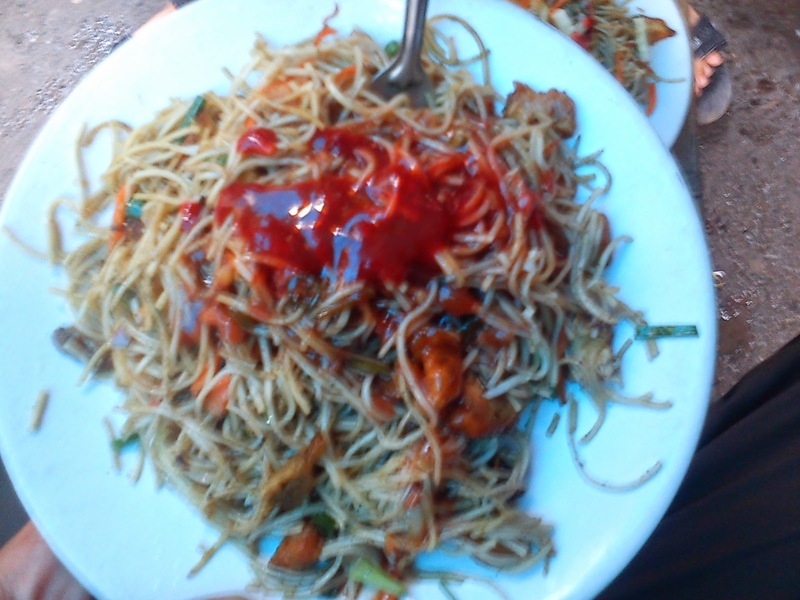 Deckers lane is also famous for its chicken chowmein. We loved eating the spicy mix of chicken with a symphony of chilly chicken gravy, making it the best part-chinese food that can be found in India. And it costs just 36/- bucks for a plate. Can it get any better? NO. We returned to this place many times and now it was the time for the grand finale. 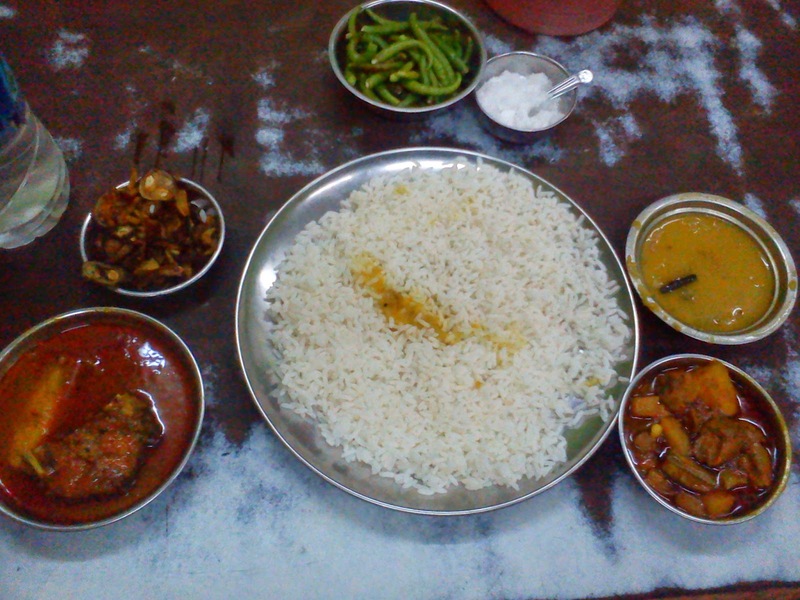 Fish and rice is the food of the common man in Bengal. The most authentic Bengali meal without which, this trip would be incomplete. We asked for the best place to have this meal as it was definitely which our friends would ask us about, so we narrowed it down to Hindu hotel and ordered a “maach bhaat”/ fish and rice. The 5 minute wait seemed like 5 light years and then the food was served. I still remember the look on my friends face when we saw what was served. It was mighty. We were served a lot of rice in a plate, a bowl of fish in curry which looked delicious, a vegetable mix with “kerela and aaloo” (bitter gourd and potatoes), a vegetable curry and a legume curry. Just count the number of things and imagine how two people would have felt after seeing the meal, the people who had walked 20 kilometers that day. Then meal was lavish and we ate till our stomachs’ full capacity. This was undeniably the best fish and rice that one can think of eating. It was exactly like we expected and we were speechless after the amount of money they asked from us. A hundred rupee note was asked for a full meal for two. This is what I love about this city. The food is so tasty and economical. One can never go hungry in Kolkata. 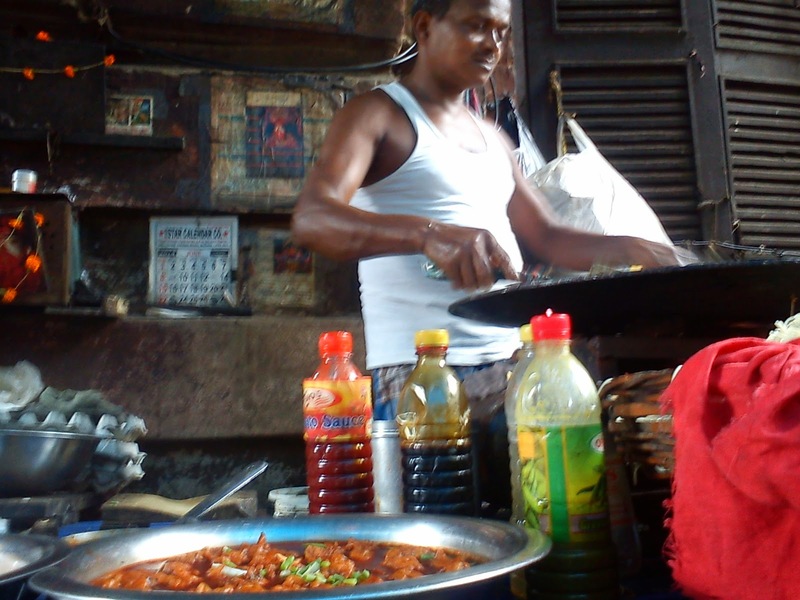 Apart from what I have already told you, I am listing some other things that you must eat in Kolkata. Ghugni is a simple but taste bud provoking meal which can be found at Deckers lane as well. They have these little earthen furnaces which burn with coal and everything is cooked on them. You get two loaves of grilled toast with butter with a pea and potato curry and black pepper sprinkled over it. It will cost you 12/- bucks and then you will finally believe that money doesn’t keep one hungry if you are in Kolkata. Puchkas are loved all over India and Kolkata is one of the places where the love for these spicy balls of pleasure is at peak. 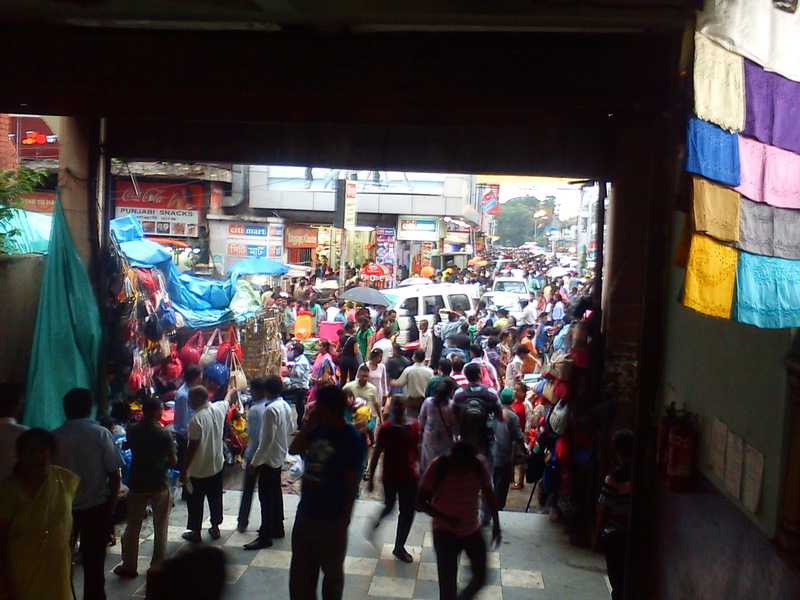 You can find them anywhere while strolling down the numerous markets from Park Street to New Market. Don’t forget to ask for extra sweet water in the end to give it a dessert like end. Can there be a visit to Kolkata without having mentioned this sweet blessing? We went to the K. C Das sweet shop (paradise you can call it) and tried a Saundesh (another gem) and authentic bengali rosugullas at just 10 rs a piece. I told you already, happiness costs less in this city of taste and tasty cuisines. Samosas aka Sinnghara are also a delightful snack which can be tried with your favorite chaa (tea) which is served in little earthen pots which gives it a real indian feeling which is priceless actually. We visited some other places which were on our list. 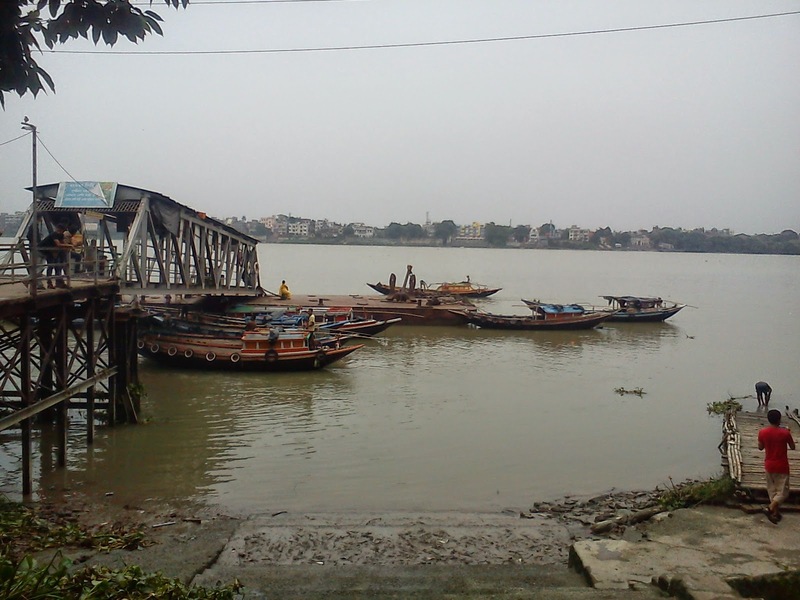 I am listing some places which you HAVE to visit when in Kolkata. Victoria Memorial is a huge and magnificent marble building which was built between 1900 and 1920. 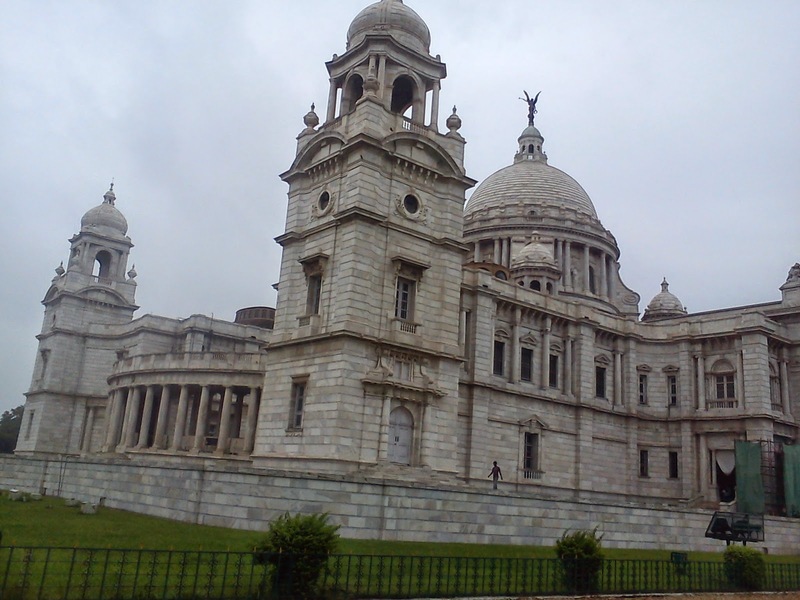 It is one of the most enthralling landmarks of Kolkata. It was built by George Curzon in the memory of Queen Victoria after her death. He said "Let us, therefore, have a building, stately, spacious, monumental and grand, to which every newcomer in Calcutta will turn, to which all the resident population, European and Native, will flock, where all classes will learn the lessons of history, and see revived before their eyes the marvels of the past." You can find her life size statue in the main hall. The whole monument has around 25 galleries in total. 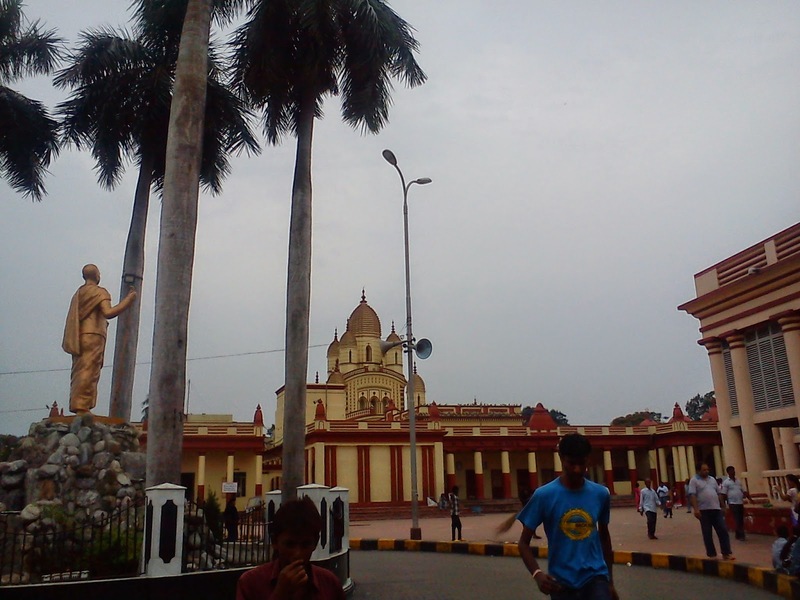 These include the royal gallery, the national leader’s gallery, the portrait gallery, central hall, the sculpture gallery, the arms and armory gallery and the newer, Calcutta gallery. There are a lot of epic works by Shakespeare and some traditional literature about music and dance if you are interested in literature. The Victoria Memorial boasts of the major collection of the works of Thomas Danielle (1749–1840) and his nephew, William Daniell. This place is a must visit for all the architecture and history lovers out there. Even if you aren’t, you are going to love it. Now for the religious folks, there are some great temples where you can quench your spiritual thirst and fill your mind with peace. 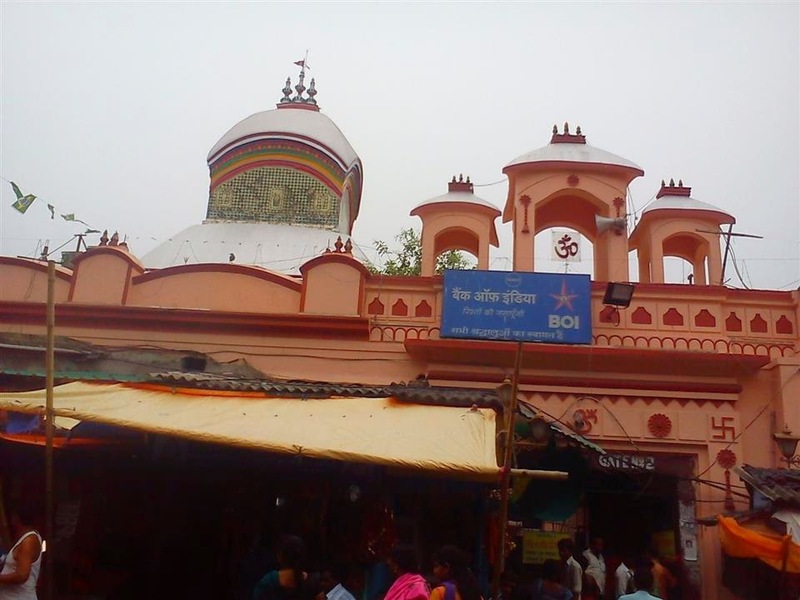 Visit the Kali Math Temple. 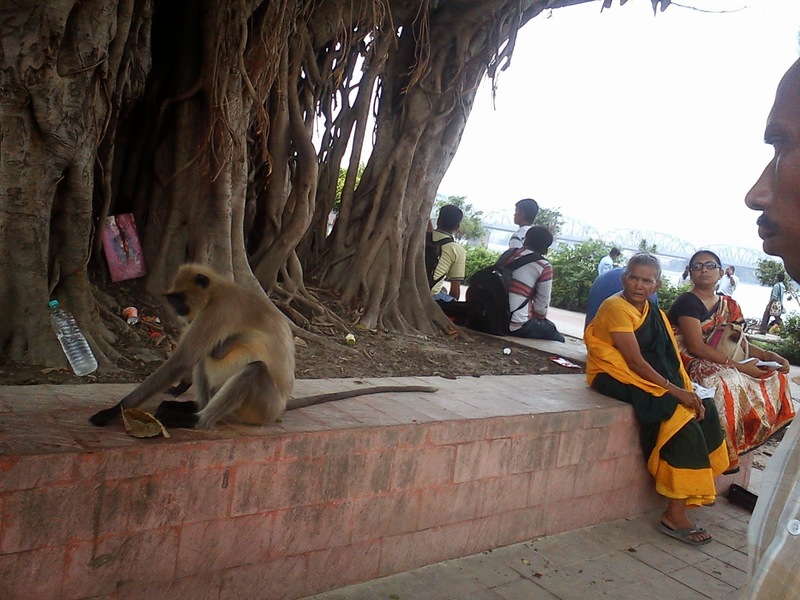 It is an easy metro ride and a kilometers walk to the temple. Please avoid the scams. People will come to you and will convince you that they will take you for VIP darshan and you won’t have to stand in line if you pay them a quick 50/- . Remember, everyone will have to stand in line, the timing depends on the crowd. You can get a lot of souvenirs for your family if you like it and don’t forget to look around a bit. Another magnificent temple is the Belur Math. Great piece of architecture with a greater atmosphere. 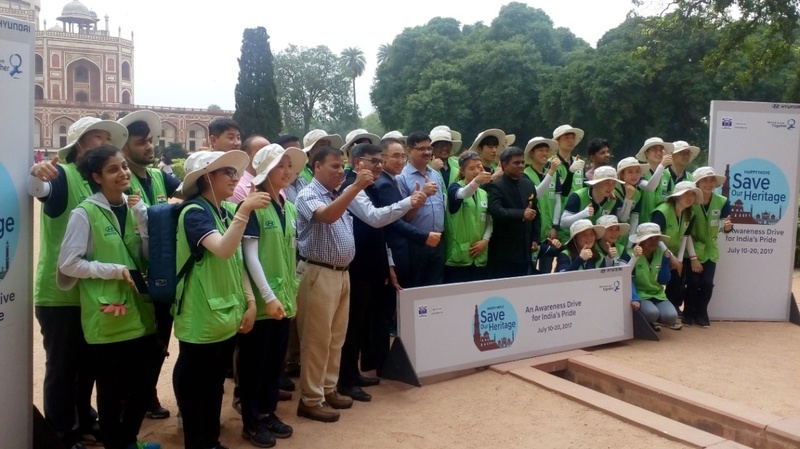 The Belur math was one of the most peaceful places that I had ever seen and it was truly a once in a lifetime experience seeing Indian culture and its heritage for real. We went to the inner hall and found many people meditating and chanting inside the huge hall. It seemed like a heavenly experience for all the seekers of the spiritual truth. 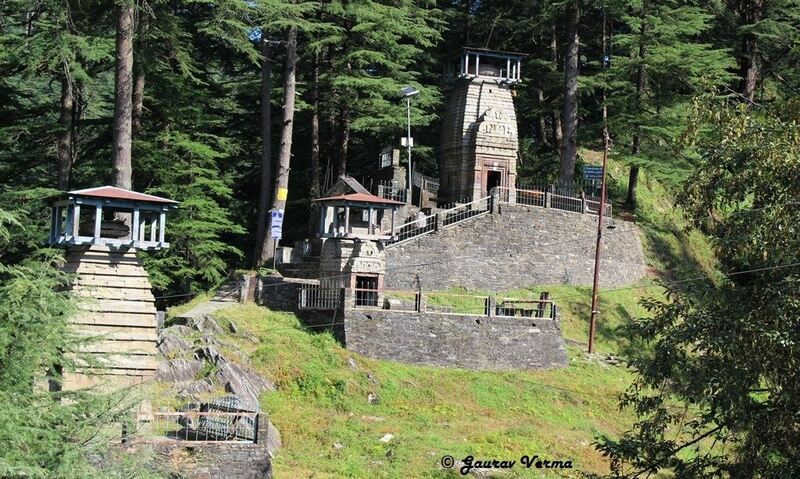 If you are one of them, don’t miss this place and add it to your bucket list. Now it was time to do something which we had been waiting since we had gotten on the train. 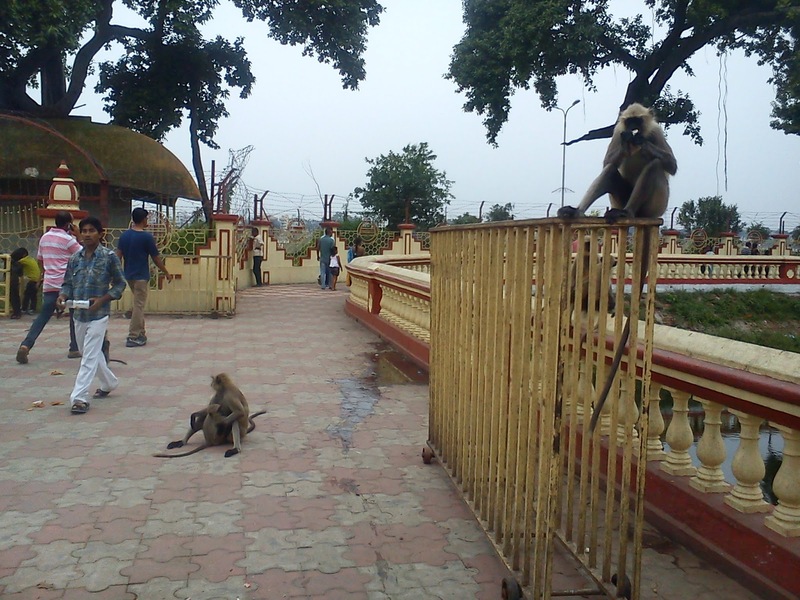 We were on our way to the next temple, Dakshineshwar. 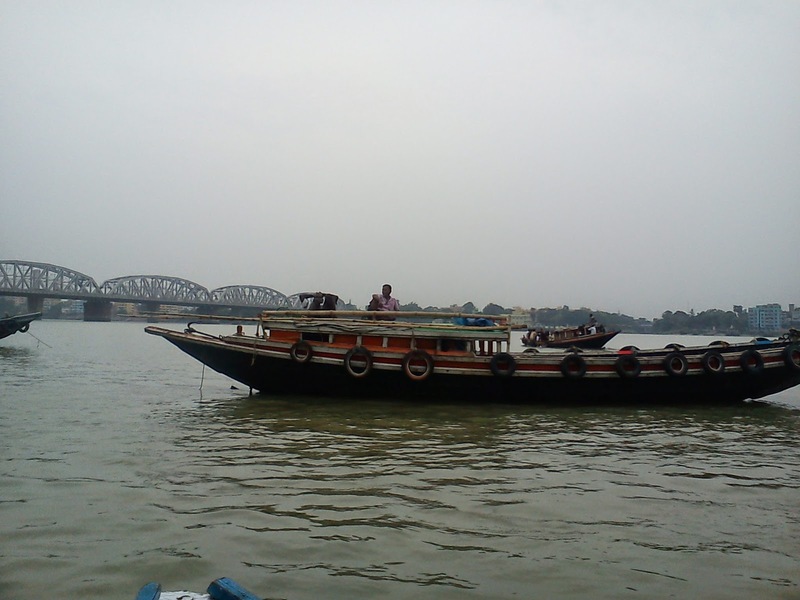 And we had to take a ferry ride all the way across the Hooghly River. It is more amazing than it sounds! When you reach the Ghats you get this tingling sensation in your feet, looking at the huge river and those little boats which carry 12-15 people at a time. We hopped on the ferry with excitement and then it started. Ah! how good it felt to smoothly sail on the greatest river in India. The waters were calm and every bit of the journey was like food to the soul. The 20 minute ride left us at the temple and this temple was an even greater structure. You can find a lot of friendly Langur Monkeys (read gigantic monkeys with huge tails who can bitchslap you with one eye closed) who sit patiently for visitors to sit with them and sometimes feed them with their own hands! 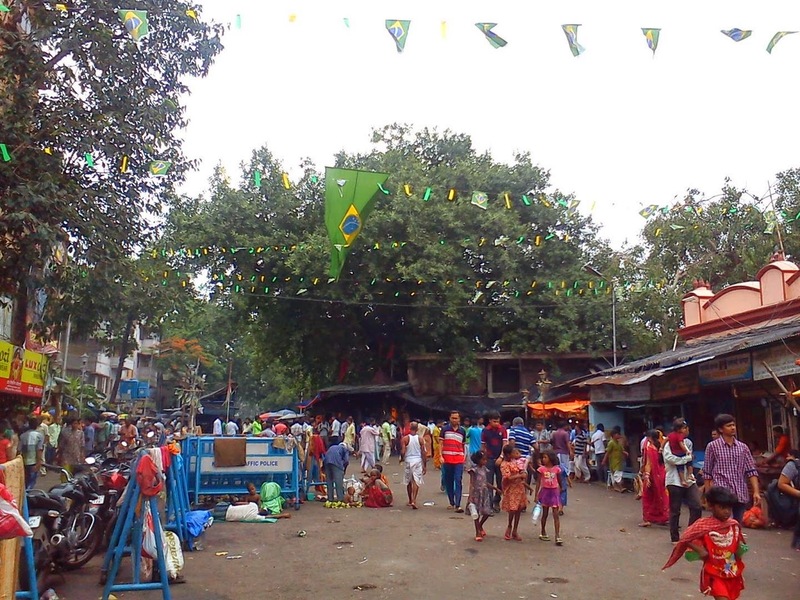 The Dakshineshwar temple starts with a lively market where you can buy statues and pictures of gods and get souvenirs for your family, there are many stalls to eat if you feel hungry after the ferry ride and all the walking. Another place to cherish and enjoy. The whole environment gives you a feeling of belonging and you do not feel that you are so far away from home. We clicked some pictures of the friendly langurs and set off to catch the returning ferry ride. We travelled mostly on foot but we enjoyed the local transport as well. Don’t forget to catch a metro ride in the country’s oldest metro rails. Ride a yellow taxi or jump up on a tram. Trams are really interesting and the way they run on the roads beside the main traffic, it is really strange and wonderful to watch. The local buses are colorful, their interiors are broken and weary but worth experiencing. Kolkata does something to you which cannot be reversed. Whether it is listening to the Bengali language which sounds so sweet that all other languages seem strange. Whether it is taking those long walks in the evening markets or just watching people as they do their daily chores around the city. Travelling to this city leaves an everlasting impression on your soul as a person and as a traveler. For every adventure and travel enthusiast, the chaos and struggle of the city is enough to pull them towards getting an experience of this city where life is simple, fast and reckless. 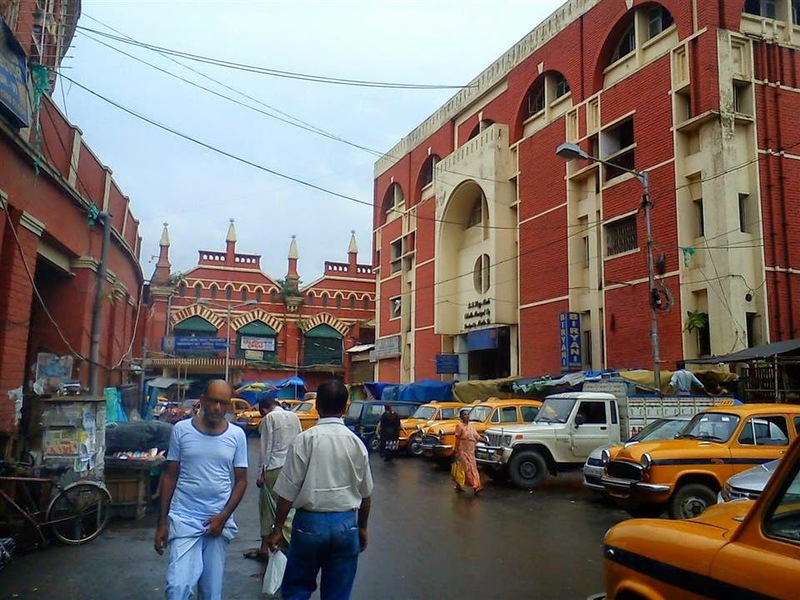 Kolkata is the perfect destination for travel veterans as well as for those who want to see India as it is, for real. Writing this makes me realize the importance of travelling and that seeing new places in life is the only thing that can make you feel alive for real. Nothing is more enriching or fulfilling than exploring the places about which you have only read or heard. 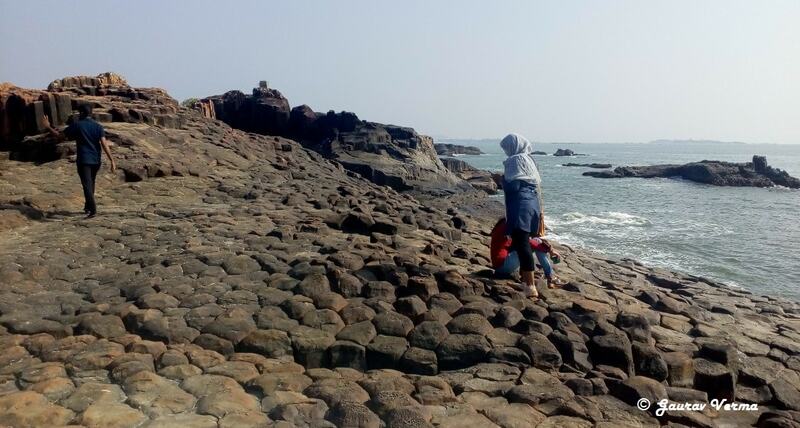 Being there, is the most addictive part about these places and I can say that I am quite lucky to have been bit by the travel bug at an early age. No job, No money, No comfort, Nothing can match the joy of travelling and a trip to a city with a spirit, like Kolkata can make you rethink about your life and goals and most probably will make you realize what you are and who you want to be. Pack your bags, leave. Kolkata is waiting.